Stay up to date on routine maintenance and keep your vehicle running like it did when you first drove off our lot! 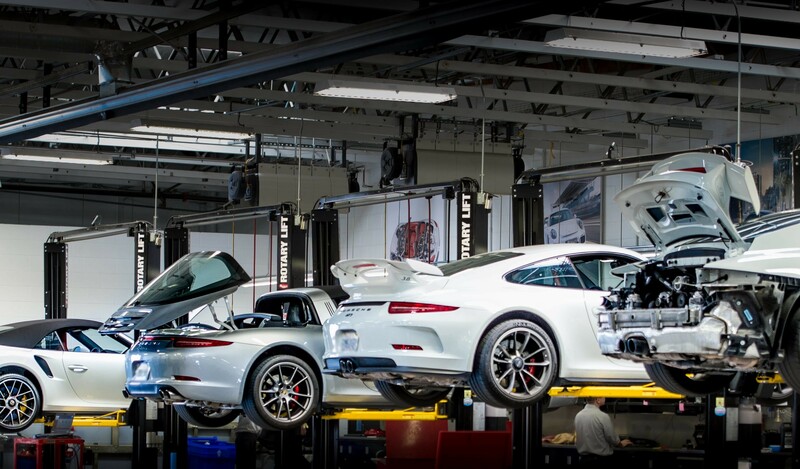 Below, you’ll find recommended service and maintenance guides for your Porsche vehicle, be it the 718 Boxster, Panamera, or Cayenne. Type your query into the search bar, or use the “Previous” and “Next” arrows to find your vehicle model. You’ll find routine services, such as oil and filter changes, battery inspections, and tire sealant replacement, along with recommended maintenance events by time or miles. Table extends further right than you can see; use the scroll bar at its bottom to see more. Cayenne S/GTS 1 10,000 Oil Change Service 9.0. 1 The engine oil and oil filter must be changed every 6,000 miles in vehicles that are driven in countries where leaded fuel is used. 2 Replacement schedule: Check at 40,000, but no later than every 4 years, check at 100,000 but no later than every 10 years, check at 160,000 miles but no later than every 16 years, replace every 60,000 but no later than every 6 years. 3 Every 120,000, but no later than every 12 years. Don’t let surprises get in the way of your daily routine. Protect your precious investment from the start and save when you choose to prepay for required maintenance on your Porsche. Tomorrow’s maintenance. Today’s peace of mind.